I did not finish this book. A motley crew from demons all over the world are jumbled together in this "Field Guide", with instructions on how to recognise them and possible protective measures. While the idea is interesting, I had several problems with this book.1. It is too haphazard. Supernatural entities that the author categorises as "demons" are hauled in from all cultures, without any criteria for the choices made.2. The descriptions are too simplistic. The author tries to strike a mock serious tone, in keeping with the title of the book, but it does not come across humourously as intended.3. Fairies, demons and characters from mythology are mixed up without any rhyme or reason.This book will be interesting to the novice in the field of myth and fairy lore: seasoned veterans will feel disappointed. DNF on page 30. This book is poorly researched and over-simplifies everything. Reading some reviews on here told me to stop wasting my time, not literally but still. Also I'm convinced this is satire but not well done or particularly funny. Actually it's grating. This was a little gem I found in my used book store. This "Field Guide" acts an an encyclopedia of demons. The preface has some sections such as "How to Spot a Demon" or "How to Spot a Fairie" that rehashes common folklore about how to identify them. But it is the rest of the book which is so cool. Divided into sections- Water, Mountain, Forest, Desert, Domicile and Psyche. Each section then has a list of entities you might encounter in their given medium. Thus we run into Tiamat of Mesopotamia (Water) or Huldrefolk of Norway (Mountain) or Wood-Wives and Skoggra of Germany (Forest).Each individual entry in each of the main sections has a picture of the entity and then the founding country/region of the entity. Then there follows a brief section on the lore and a brief disarming and dispelling techniques. It is an amusing read, though I am unlikely to worry overly much about demonic infestation. I enjoyed the collection of lore and the pictures. The mix of demons goes around the world and all cultures from India to Ancient Mesopotamia. This was a fun little read and an excellent addition to any collector of Demonology or just someone who enjoys reading fantasy and would like to know what is what and where the original stories come from. A book of folklore gathered from around the world.I never realized that there are so many types of evil fairies and other creatures that go bump in the night.Highly recommended to fans of fables & mythology. Despite the lurid title, this book has a focus beyond things that go bump in the night. The Macks look at pre-Christian ideas about spirits, particularly the Greek daimones and the idea of the genius loci that looked after sacred places. So the reader gets an idea of these spirits as primal forces as well as evil powers. And seeing the similarities in folklore across continents and through a wide span of time gives some keys to the psychological roots of our obsession with these 'subversive spirits.' I think the afterword covers it best, in which the authors talk about the need for mystery in a world that's too often filled with an excess of information but not a lot of wonder. I don't know, I got this book back when I was younger, thinking it would be a cool read. Unfortunately, it seemed like a lot of what was in the book wasn't so well researched; or, if it was, differed greatly with other descriptions of the daemons presented that I've read. The one thing I will give it, is that it is absolutely a multi-cultural book, and for that gives an amazing look at the similarities in mythologies around the world. Have had this for years. Primarily use it as reference material for quick synopses of supernatural entities, although I've read a lot of these entries are very over-simplified and sometimes conflicting. Still a fun little tome for snapshots of the strange and dark entities of the worlds oldest myths. The Field Guide to DemonsCarol K. Mack This nifty little volume is an encyclopedia of minor spirit being that live outside the realm of human life. The authors traverse through the lores of many cultures, defining the beings and then analyzing them. Often times these being are very mischievious cause trouble for the human folk. Sometimes , however these being can be quite helpful. These demons/fairies come from 6 different realms. The domains are the : water, mountain, forests, deserts, domiciles and psyche. A given entry of demons will start off with first how to identify the demons and then discuss the lore or tale they have been in. The book also tells you how top defend youerself against the fairie's/demon's magic. In the realm of water TEh book discusses Tiamat the demon of Babylon. Along with her consort Apsu she created a myriad of gods, but these gods made a lot of noise. Apsu soon got tired of trhe noise and conspired to kill the offspring. Tiamat kills him first. Later on Marduk her great gandson challenges her and her new consort Kingu and kills them both in battle. Different parts of Tiamat are used to create diffent parts of the universe/ From Kingu's blood he creates mankind. From the mountains comes the Mesopoatamian Demon Huwawa. Huwawa is ent by the God Enlil to guard the Cedar forest of Lebanon. The Sun God Shamash sent Gilgamessh and his friend Enkidu to cut down 7 Cedars. The two slay Huwawa and accomplish the mission. Then Ishtar ties to seduce Gilgamesh and fails she send the bull of Heaven to kill them. Gilgamesh and Enkidu prevail. Enlil retaliates by killing Enkidu. THe Shedim of Judaic Lore are demons that come from the forest.They are small hairy and wild. They have big noses and lolling tongues. Generally they are regarded as unclean spirits. Spitting tend to drive them away. In Russia a hunchback is seduced into dancing with the Shedim. As a pledge for him to return they take the hump off of his back and he is able to walk straight.. His twin brother seeing this decide to do the same thing. When he reutrns they giove him his brother's hump. Iblis is a demon from the Arabian Desert. He refused to bow tro Adam the first man. For that he was cast down to earth forever a curse to mankind. In another story his dominioon is eraduicated and he is broguht to Allah's realm and educated in matters of holiness. When his djin regroup on the earth he goes to dopwn to rejoing them and be their. The croucher is a demon that exists in the home. The demon is from Babyon. (You can tell I love Babylon) Thyis demon sits at the threshold of a house and waits to attack people as they walk in. Shutting the dorr helps keep them at bay. In te realm of the psyche is a demon called Gerasine. It was driven out of a madmen by Christ weho used prayers as the means of exorcism.They were driven into a heard of swine and driven into a lake.This book is great for anyone studying demonaoly. I bought it because I wantred to write a book. Something that I like about the review they had for this book was this From the Tommyknockers of North American mountain mines to the South African Mbulu that waits in the river for lone travelers, A Field Guide to Demons classifies these creatures by their domains--water, mountain, forest--rather than in alphabetical or cultural order, dishing out antique and contemporary lore on these most misunderstood of spirits. I loved this book. It's an encyclopedia of sorts but is broken down into realms (water, mountain, psyche, etc.). The author gives an overview of each being but the best parts are the "lore" entries which generally give at least one folk tale on each being. The book also does a very good job of casting it's net among a variety of cultures making it a good tool in looking for similarities. Handy little primer on several different species of supernatural creatures and their roots. I was hoping it would have more a demonology bent to it, but the book uses an alternate meaning for demons and fae which was new and interesting, but not quite what I was looking for. Still, lots of great character inspiration in here and the book now sits on my reference book shelf next to my computer. This is a totally fun, fascinating look at demons and malevolent spirits from all over the world. At times it is of necessity disappointingly brief in its descriptions, but the wide-ranging bibliography at the back of the book provides more than enough fodder for those who want to delve deeper into the subject. An interesting collections of mythological creatures and their historical impact. A lot of the information contained in this guide is inaccurate. This illustrated guide reveals the remarkable permutations of demons and fairies throughout the world; an exploration of global mythologies throughout the ages, as well as the different habitats in which these beings can be found since the specific nature of the habitat somewhat shapes the nature of the particular spirit. The habitats include: Water-the element of formless potential; Mountain-the sacred abode of the divine spirit of fairies; Forest-the wild kingdom of mostly predatory demons often camouflaged as beasts or trees; Desert-displayed as powerful sandstorms or shapeshifters in friendly guise or even alien form; Domicile-houses the most variegated species of demons, each portion defines its specialties; The Psyche-the terrain to recognize all of our own personal demons, once home to the Seven Deadly Sins, in this century, is now home to the Id and the Shadow. Each entry gives a description of the being and their country of origin as well as a tale or two describing their feats (or defeats, in some cases). Many of the entries also offer "dispelling and disarming techniques" but give no real explanation as to how or why these techniques work. I found the book interesting and informative, although it seemed redundant in places, and downright ludicrous in others (whether or not you believe in the existence of these creatures). I do wish it had been longer and covered more of the "subversive spirits" mentioned in the title since more than 95% of the entries were demonic, and only one entry was a fallen angel. Maybe one and a half stars. The book would be great for writers of fantasy and horror if they need to find a new slant, a different type of protagonist. The authors have collected stories/creatures from across the world, but it ends up being very superficial, the authors' gift being a determination to tract down stories rather than understand and interpret. Perhaps they feel understanding and interpretation is best left to the reader. The authors do present a world-wide selection: any other-worldly creature who might be considered to distract/seduce, wreak mischief or malice upon the lonely. The book is divided into water, mountain, forest, desert, domicile, and psyche sections, with a strange mixture of gods and demigods, fairies, demons, myths, and folk-tales thrown in each section. Each character is described in appearance and behavior, followed by a folk story, followed by a final paragraph of how humans might best protect themselves. The final chapter is especially eclectic, delving into Freud and Yung, literary characters, religious obstacles/sins, and werewolves.There might have been other ways of grouping these characters that would have made more sense to me. Mythology and psychological terms of Jung and Freud should be interpreted very differently than folk conspiracies ("Children have wandered away and drowned in the river--it must be malicious fairies. ""I came home to find my wife in bed with a strange man and she swears she was under the spell of a demon."). In areas where I had more background I noticed errors and misinterpretations in the authors' account, which made me leery when reading character descriptions that were unfamiliar. Again, it might be great for writers looking for an unusual protagonist. I like reading about fairies and the like. I like indulging my childish side, what can I say. I also enjoy reading about various mythologies and religions, and this book also indulges that side.Broken up into areas such as forests, deserts, domiciles and psyche, this 'guide' presents demons and the like that inhabit the world and where they live. It is also highly multicultural, with demons et al from Europe, the Middle East, Asia, Africa, America and Australia. This wide-ranging research comes along with religious ideals, dating from Babylonia to today. In the Psyche section, it also presents ideas from Freud and Jung, along with stories such as Dr Jekyll and Mr Hyde. There are a few points where Mack&Mack confuse certain mythologies. In the Water section, while talking about Mermaids, they briefly mention Selkies without acknowledging it as such. However, this is a minor complaint, and in scope of the wider text, just a small error. What I particularly liked is that although it is essentially a young adult novel, it's written in an adult manner. Like other reviewers have stated, this would be a good guide for authors, as it is not only split into regions, but it also has the country of origin, the behaviour and ways to dispel the demons. Overall, interesting, useful and amusing. Demons, fairies, and fallen angels are everywhere. They lurk at crossroads, crouch behind doors, hide in trees, slip into beds, wait in caves, hover at weddings and childbirths, disguise themselves as friends and relatives—and even pretend to be you! They are powerful; they are protean; they are enchanting. And, to the uninformed, they are often invisible. This illustrated guide—the first of its kind—reveals the remarkable permutations of the demon and fairy species worldwide. Packed with lore about each demon, detailing its origins, the culture surrounding it, and its reputed antics and exploits, this is a fascinating exploration of global mythologies. 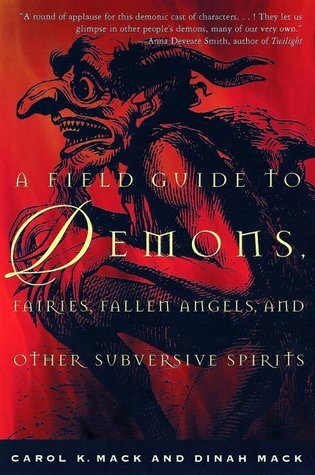 Perfect for the armchair traveler and the intrepid, seasoned demon-spotter alike, this complete guide of subversive spirits offers a behind-the-scenes look at the devilish mishaps, impish irritations, and demonic devastations that can punctuate our lives. Be warned: demon-watching is thrilling, transforming, even addictive. Soon your FIELD GUIDE TO DEMONS will be absolutely indispensable! Along with a chapter of 'Who's who in the domicile' this field guide covers creatures, some familiar, others not (at least to me), divided into the various realms of 'Water', 'Mountain', 'Forest' and 'Desert' in what I felt was a fairly comprehensive guide albeit one restricted by its relatively short length. Covering demons, vampires and so on from all manner of cultures this is a wonderfully descriptive read in which the authors take us through not only a description of the various creatures but also the lore surrounding them and, perhaps most interestingly of all, 'disarming and dispelling techniques' that tradition has wards them off.Fascinating stuff, I'd suggest this as a great reference book for all those interested in the 'supernatural and/or folk lore.Copyright: Tracy Terry @ Pen and Paper. I found this book to be interesting. The information contained in this book was stimulating. I personally found slight humor in one part of the book. There is reference to a creature known as a Bunyip in this book, and for anyone who is a fan of the TV show "Charmed", you will remember that there is a Bunyip entry in the Halliwell's Book Of Shadows, it's this part that I found slightly funny, simply because what was supposedly a made up magical creature, might really be real.However, if demons, fallen angels, faires, and other such magical creatures interest you, then this book is for you. If anyone has an interest in these things, then I recommend you read this book. A FIELD GUIDE TO DEMONS This book serves well as a reference guide; as well it should, being that it is just that. The book is separated into 6 main sections: Water, Mountain, Forest, Desert, Domicile, and Psyche. The sections are arranged by location such as, North America, Japan and so on. Each reference tells a bit about the lore and also the dispelling and disarming techniques used to eradicate the demon. This book is a good tool for horror writers and or fantasy writers. Any demon within these pages could become a writer's antagonist. The problem with this book is it is very vague in its approach to the history of the demons. Perhaps a more comprehensive layout would serve writers and enthusiasts better. This is an odd book. I'm not sure if the Macks are kidding when they talk about the demons and the "sighting" of those demons and spirits as, what seems like, real events. Or if they really believe what they are writing... That aside, I suppose this is a good starters guide (very starters, too, like if you knew nothing about anything supernatural related). The book is broken up in to categories (Water, Desert, Mountains, Psych, etc). I wouldn't say that it's a 100% accurate, either. Though, seeing as these creatures don't exist, how accurate can you really be...?I know a fair amount about Japanese mythology, and I doubt that they interrupted the myths accurately. Particularly in regards to the "Oni". Saying I've "read" this book might be a stretch. I've had it lying around for many years and through the course of flipping through it I've probably read most or all of the entries. I've always enjoyed having it around, and I think I'll continue to do so.The book is written in a playful manner, acknowledging at the onset that its talking about mythological creatures, but sometimes slipping into sections wherein they are treated as real. It IS a "field guide" so each entry is rather short. 1-4 pages. So the information you get is pretty superficial, but its great as a starting point for further learning or just to get your imagination running wild. Especially since it covers demon-ish dudes from all over the world and all eras of history. This book can be take literally or can be taken as stories with morals behind them. I love books that tell you certain things about different cultures, while certain demons sound the same, they have different stories to go along with them, although the morals are the same, the way they reach them can be different.I also like the fact that they sectioned each lot of demons with a different element so that it was clear where you were more likely to find them.This is one of the rare books that I would most likely either read again or purchase. While this book has some interesting information I still hold it suspect do to the inaccuracies in the entry on the God Set as that falls within my area of expertise and what they wrote grated on me. The book did redeem itself somewhat with its discussion of the nature of Demons in the Buddhist tradition and at least avoided turning them into the mindless slavering harbingers of doom so common in the West. All in all, I don’t regret buying and reading it but I could hope for more for my time and money. a nice general introduction to the general facts and folklores of many demons & spirits. gorgeous woodcuts. fascinating. took a star off though, for the authors sometime cutesy and humorous approach to the book. i found it immature, girlish, and disrespectful to people's cultures. i mean, what's so funny about a six headed monster with a eight arms that rips off people's heads and eats their hearts? let's have some respect for different cultures and their historical folktales and not giggle over it like a bunch of superior ninnies at tea. Interesting anthology/encyclopedia about the mythology and lore surrounding supernatural creatures. To me it's reminiscent of a textbook that would be used at Hogwarts :-). It does concern me though, that the author seems go put a lot of stock into what she calls "dispelling and disarming techniques". These things aren't real - as far as I know - and yet there are legitimate ways to scare them off. Good "fairy tale" book but I wouldn't treat it as a "field guide". This book was a fantastic volume of information. It takes almost all fears, demons, and creatures and places them in their elemental worlds, nations of origins, and logs their histories, motivations, and goals. Also, where able, it lets you know their weakness and means of destruction. I would recommend this book to anyone interested in the world of evil or the unnatural.Who knew that Pazzuzu was real?